XIAMEN, Sept. 4 (Xinhua) -- Chinese President Xi Jinping on Monday called for solidarity among emerging market and developing countries. 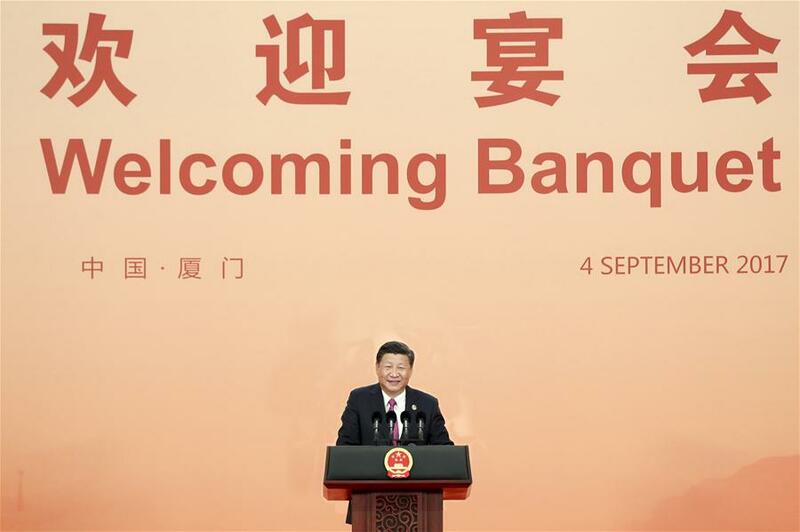 Xi made the remarks when addressing a banquet for those attending the ninth BRICS summit and the Dialogue of Emerging Market and Developing Countries in the southeastern city of Xiamen. He likened Xiamen to a window of China's opening up and a hot land for innovative development. With leaders from BRICS countries as well as other emerging market and developing countries gathering here to discuss cooperation, the city will be left with a new legacy, he said. "Though we are far away from each other geographically, common dreams and pursuit have made us good friends and partners," Xi said. As long as emerging market and developing countries "pull their minds and efforts together, help each other and work hand in hand," they can create more "miracles of development like turning soil into gold" and enable their people to live a life of "being well-fed and well-clothed," he said. Xi called the BRICS summit in Xiamen a success with fruitful outcomes. "I sincerely hope that the Xiamen summit will open new doors of cooperation and development, ushering in the second golden decade of BRICS cooperation and a bright future for emerging market and developing countries," the president said. On Monday, Xi, Brazilian President Michel Temer, Russian President Vladimir Putin, Indian Prime Minister Narendra Modi and South African President Jacob Zuma attended the summit, themed "BRICS: Stronger Partnership for a Brighter Future." On Tuesday, China will hold a Dialogue of Emerging Market and Developing Countries, in which leaders of Egypt, Guinea, Mexico, Tajikistan and Thailand will join the BRICS leaders in discussing global development cooperation. After the banquet, the guests, accompanied by Xi and his wife Peng Liyuan, watched a gala at the Banlam Grand Theater. At the gala, with a theme of "Setting the Sail for the Future," artists performed classic Chinese songs, folk dances, the ancient local music art form Nanyin and a classic Italian aria -- a blend of East and West cultures.